I don’t want to be dramatic but this feature saved my life! Assuming I live to 88 years old, I currently have 508,080 hours to live, this is almost the amount of hours I needed to do a manual edit of an account I was working on. Ok , maybe I am being a bit dramatic but you get what I mean right? Here is the low down, a few years ago we had a large education client who was spending nearly half a million dollar on Facebook a quarter. The client’s account had 336 campaigns, 1863 Ad sets and over 5000 ads running at any given time. The build itself took us 3 days with 2 people working on it. As expected with this amount of work done in a short time we made a few mistakes. Some tracking parameters were wrong leading to either 404s on some landing pages or not passing data to third party tracking tools. The task was made more complicated by the client wanting to use click trackers from doubleclick to help dedupe traffic for better attribution. The task now was to update all ad parameters with unique UTMs that match the campaign, ad set and ad. That is over 5000 ads to update. Luckily I discovered Facebook’s power editor bulk import function. The feature makes it easy to bulk upload changes from any aspect of the account. Let me show you how we fixed the problem. Go to Power editor and export you file. You should have all campaigns and ads created before doing this. 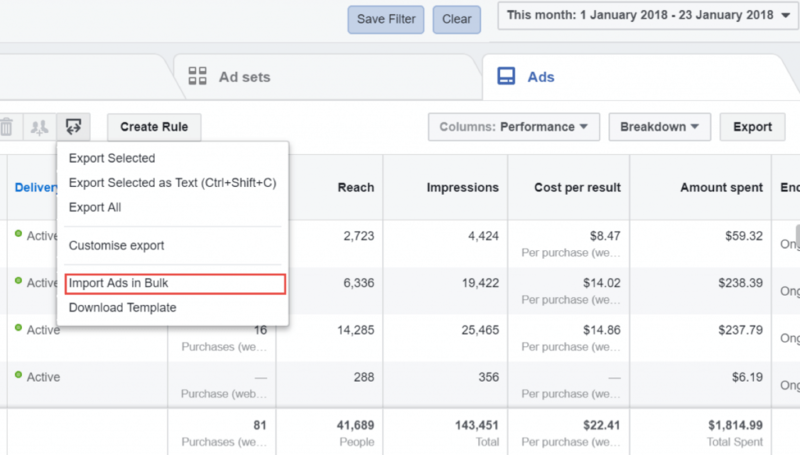 You can either export the full account or select campaigns, Ad sets or Ads you want. Facebook have introduced a customise export function that makes it easier.The feature allows you to select the columns you want. I haven’t used it myself but feel free to try and give me your feedback. Once you export the items, you will get a standard excel doc with about 281 columns! 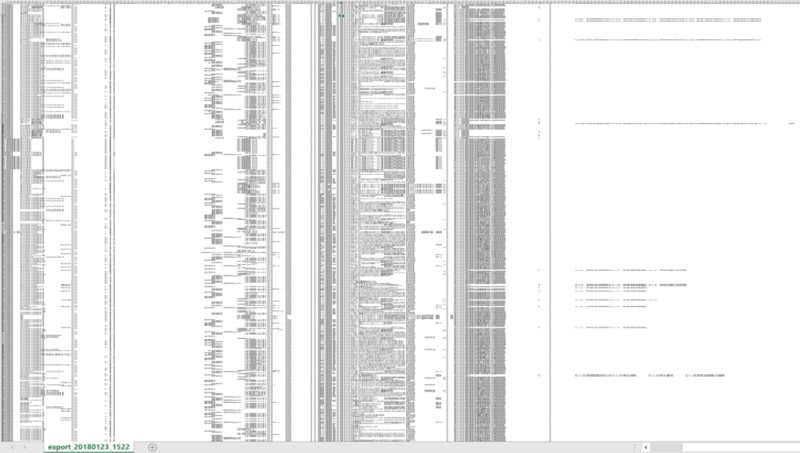 This is what 281 columns zoomed out looks like. No wonder Facebook introduced the customise column feature! This is what you need to edit. The cleanest way to do this is dependent on your naming convention strategy whilst you were setting up the campaigns. 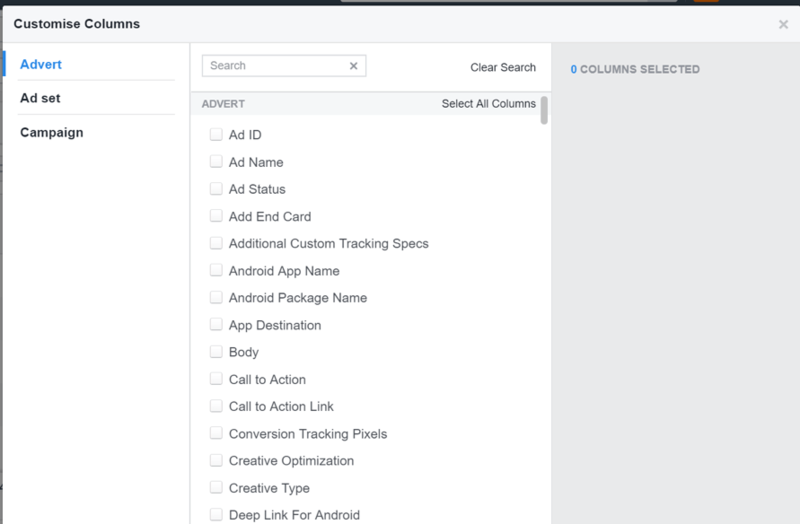 If you had a unique naming convention for each Campaign, Ad set and Ad then you can create a formula that uses the Campaign, Ad set and Ad colums on the sheet to create a unique UTM tag. Alternatively you can use a UTM generator from on an excel sheet to generate the UTMs then paste them on the sheet. Jimmy Data has a video on UTM tags here. Be careful to exclude the “?” at the start of the URL parameter as Facebook appends it internally.